Operation Organization: Professional Organizer Peachtree City, Newnan, Fayetteville, Senoia,Georgia: Organizing with Post-Its - A Color Coded Calendar! Organizing with Post-Its - A Color Coded Calendar! 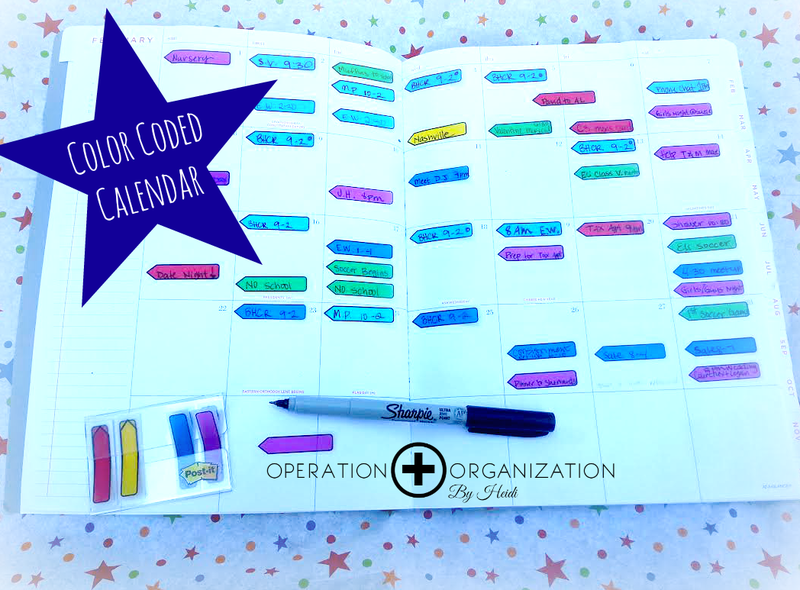 Here is a fun and simple solution to keep your calendar and family schedule organized! Color Code activities and events with POST-IT flags! Even with all the electronic options available for calendars these days, it is still my personal preference to have an old fashioned paper planner. I have always been a fan of color coding as it allows you to quickly and easily identify items or tasks. With just a glance, I can recognize who and what type of activities are scheduled. I have experimented with simply using colored pens or highlighters in the past, but found that ink went through the thin pages of the planner which didn't look very nice when you turned the page. Also, in my work as a Professional Organizer, it occasionally happens that a client needs to re-schedule their appointment. You can't erase pen and highlight. I LOVE how easy it is to simply pull up the post-it flag and re-attach it to another day! That feature is also super helpful for recurring tasks like a long term project or extra curricular activities for children - just keep moving those flags! I have been using this system for about 3 months before sharing to make sure that I didn't have a problem with flags falling off, but so far it has worked beautifully! I purchased all the supplies for this project at Staples in Peachtree City. Check out my other article, 10 Ways to Simplify Life by Color Coding for more ideas like this! Disclaimer: I was not reimbursed for the use of or mention of these products. I've just had personal success with them and like to share what works well for me and my clients. All opinions are my own. Do you need some help to brainstorm some simple solutions to succeed? Contact me to learn more about how to get organized with my Professional Organizing services. Operation Organization by Heidi provides customized organizing solutions to 'cure' your unique clutter challenge / condition. Based in Peachtree City, Georgia, I serve clients one-on-one in the surrounding area of Fayette and Coweta County (Peachtree City, Fayetteville, Tyrone, Senoia, Sharpsburg, Newnan, Brooks and beyond) . I also have specialized services to aid long distance clients with virtual organizing coaching services as well.